Dan has been teaching six days a week, but May 31 through June 2, he had a gap. 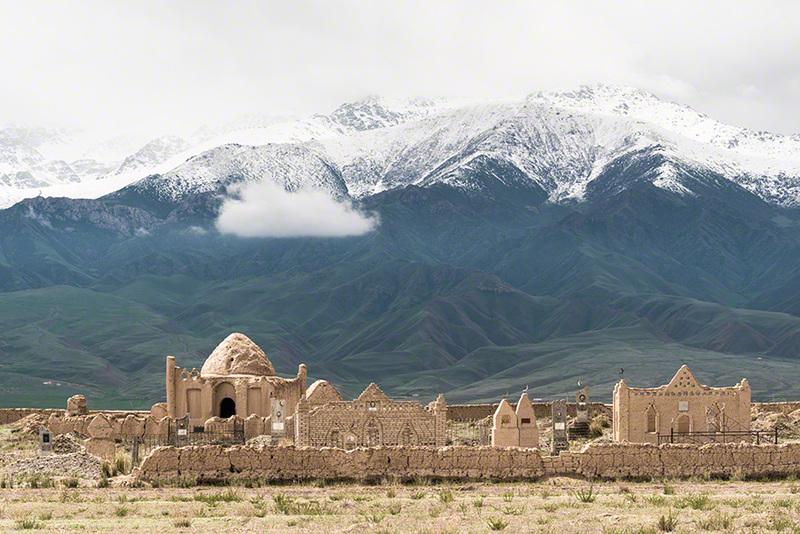 Through Artiom, we hired a driver/guide to take us to Naryn and Tash Rabat. 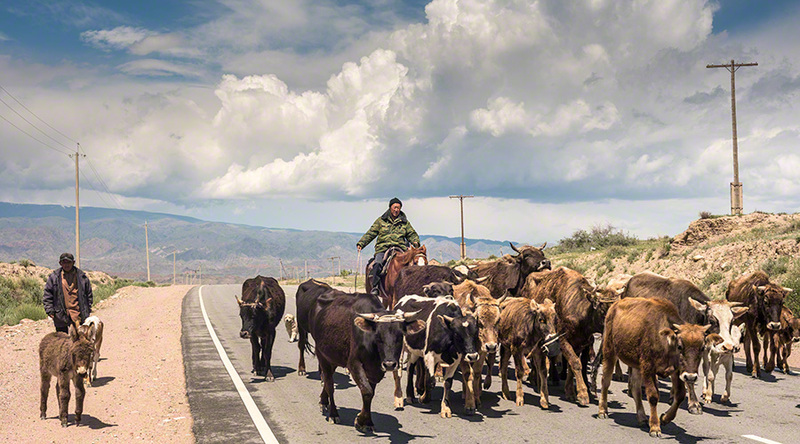 The road to Naryn, sometimes good, sometimes very bad, had quite a few interesting sights along the way. 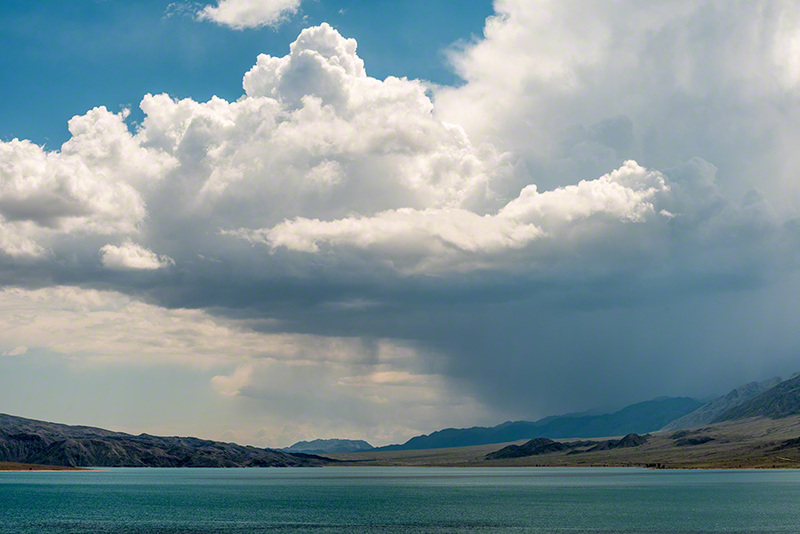 One constant was the fabulous clouds. 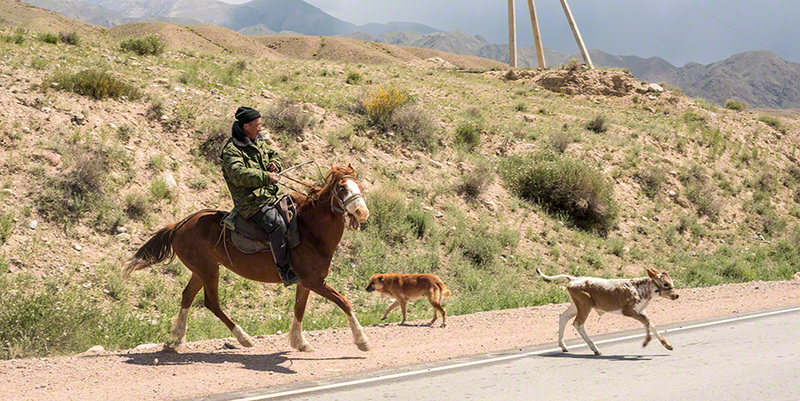 We saw Kyrgyz shepherds on horseback moving their animals: cattle, horses, flocks of sheep. All along our journey, we noticed that the hillsides have a corduroy texture from the thousands of animals that move horizontally along their steep flanks. 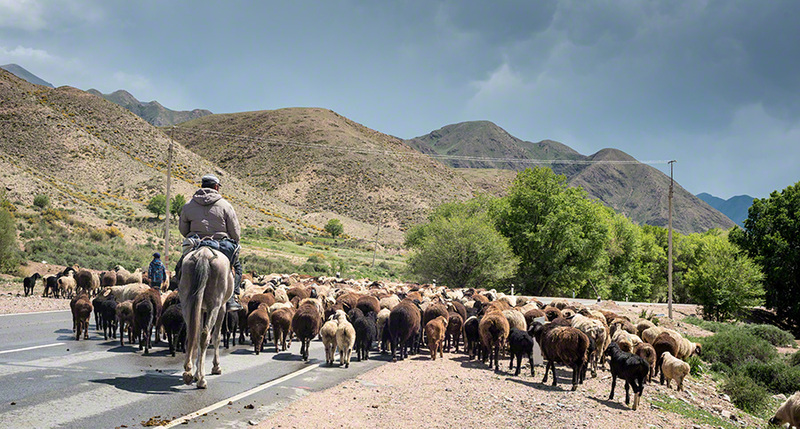 We drove through inter-mountain valleys that were sometimes at an elevation of about 3200m/10,500 feet). On each side of the road, the mountains were still covered with snow--recent snow. 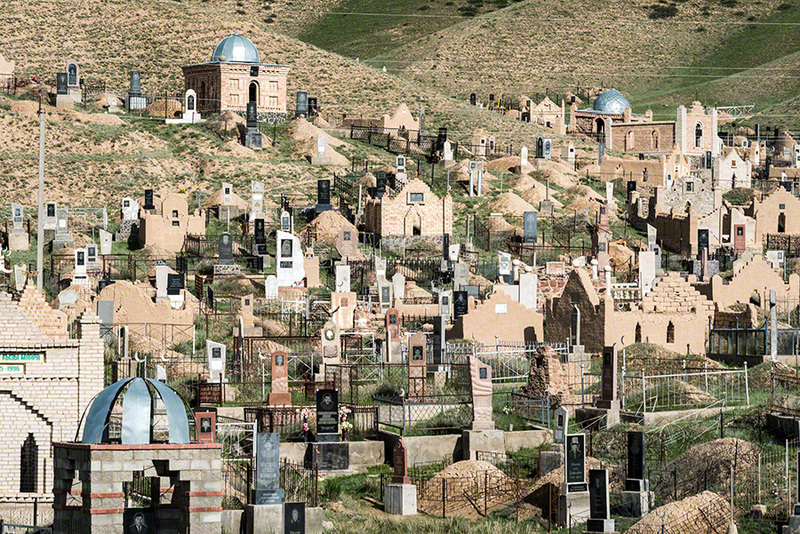 Kyrgyz cemeteries look like miniature villages and they always seem to be located in a place with a great view. Along the way we had lunch at a private home in Kochkor that is part of the Community Based Tourism (CBT) network of guesthouses in Kyrgyzstan. The house was spotlessly clean and the lunch delicious. Other places in Kochkor include a handicrafts shop that has about 200 craftspeople contributing work to it. Kochkor has the requisite statue of Lenin, but I prefer the poster of Lenin that was hanging next to the shower door at the handicrafts shop. For the two nights we were gone, we stayed in Naryn at another comfortable CBT guesthouse. Naryn is a city of about 48,000 people. In the Soviet era, it had factories that produced bricks and agricultural products. Today, the factories are empty. Nobody seems to be an early riser in Naryn. Our breakfast wasn't until 8:30 so Dan and I strolled the streets of Naryn until it was time to eat breakfast. 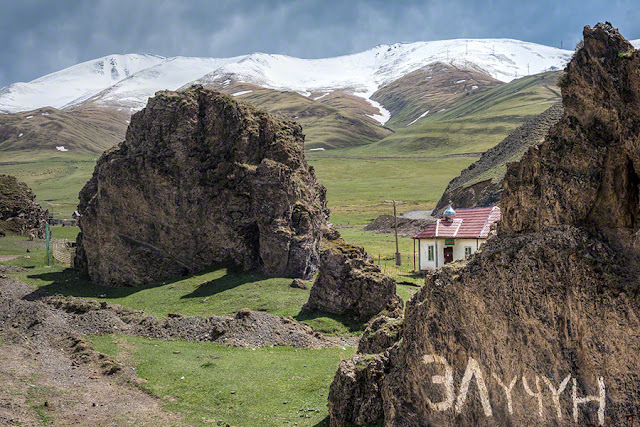 Naryn did have some photogenic sights. 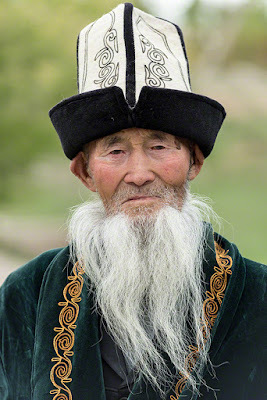 We (actually Dan) ambushed a traditionally dressed Kyrgyz man who told us he was 93 years old and was happy to have his photo taken. 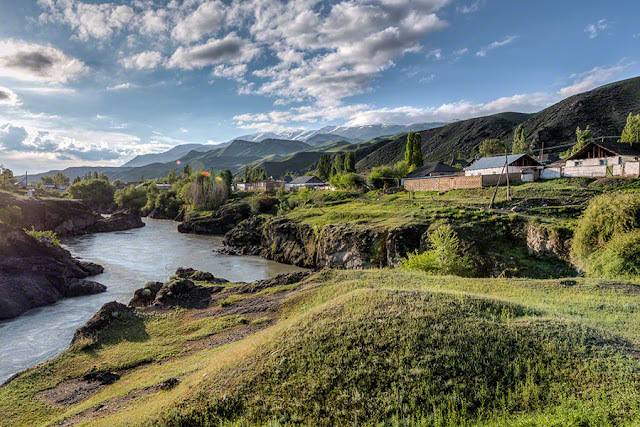 The Naryn River was quite stunning early in the morning. And, an interesting mosque built about eight years ago.